When frankincense essential oil is inhaled, it triggers the brain to release chemicals that calm the mind and ease emotional tension. For this reason, many people choose to add a few drops of frankincense essential oil to their bath at the end of a long day. This oil can slow down the nervous system, encouraging longer, slower breaths and a normal heart rate. In fact, frankincense essential oil is considered to be a natural sedative (source). Remove the lid from the top of your oil diffuser. Fill the tank of the oil diffuser with water. Be careful not to exceed the maximum fill line. Remove the cap from a bottle of frankincense essential oil. Tilt the bottle so that the spout of the bottle is leaning toward the tank of water. By tapping your finger against the side of the bottle of oil, release four to five drops of oil into the water. Place your oil diffuser in the room you plan to occupy. Plug the oil diffuser into an outlet and turn it on. Sit in an area that is close to the oil diffuser and concentrate on taking deep breaths through your nose. Frankincense essential oil can heal wounds such as cuts and scrapes very quickly. Because of its antiseptic properties, the skin will heal faster and the risk of contracting an infection will be enormously reduced (source). Studies show that the antimicrobial properties in Frankincense will fight off infections as well, especially when combined with myrrh essential oil (source). 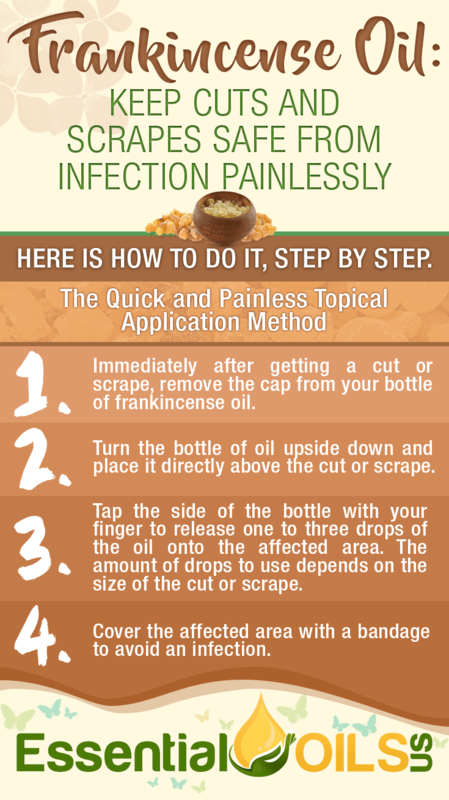 Immediately after getting a cut or scrape, remove the cap from your bottle of frankincense oil. Turn the bottle of oil upside down and place it directly above the cut or scrape. Tap the side of the bottle with your finger to release one to three drops of the oil onto the affected area. The amount of drops to use depends on the size of the cut or scrape. Cover the affected area with a bandage to avoid an infection. Because frankincense essential oil is an effective disinfectant, it can help you maintain optimal oral health. Its strong, pleasant smell will mask bad breath. Its anti-inflammatory properties can ease sensitive gums. Plus, its healing abilities can eliminate painful canker sores (source). Indian traditional medicine has been using frankincense essential oil to maintain good oral hygiene for centuries. Recently, a study has demonstrated frankincense essential oil’s ability to fight plaque as well as periodontal disease (source). Fill a clean 20oz bottle with water after removing its cap. Remove the lid from a bottle of frankincense oil. 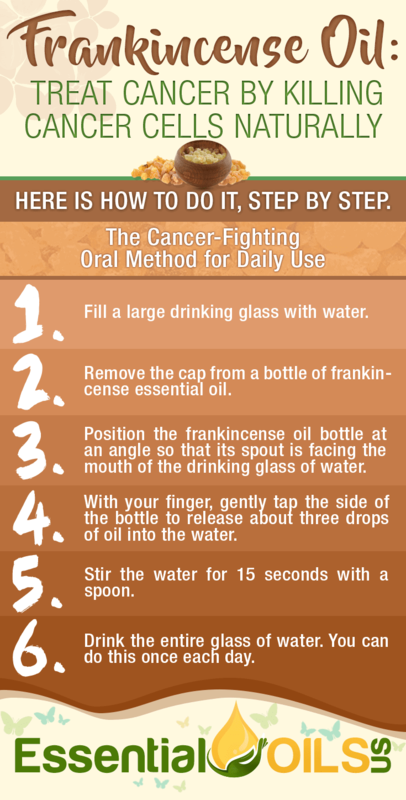 Position the frankincense oil bottle upside down and hold it directly over the mouth of the bottle of water. Shake the bottle of frankincense oil, allowing about 30 drops to fall into the water. Tightly place the cap back onto the bottle. Shake it vigorously for about 30 seconds. Use this solution as an oral rinse twice each day. Pour approximately one tablespoon into your mouth, swish it around for 60 seconds and spit it out into the sink. Frankincense essential oil is a powerful astringent that will clean the skin thoroughly while protecting skin cells from sun damage and environmental damage. It can even out the tone of the complexion while eliminating sun spots and age spots. Frankincense essential oil can also improve skin’s elasticity which often decreases as we age (source). Frankincense essential oil’s Cytophylactic properties encourages the regeneration of healthy skin cells that leave skin looking young and glowing. It can even eliminate the appearance of wrinkles and fine lines when applied topically on a daily basis (source). Remove the cap from a clean and empty 10oz plastic bottle. Fill the bottle with a thin and easily spreadable carrier oil such as olive oil or jojoba oil. You may choose to use a small funnel to make pouring easier. Twist the cap off of a bottle of frankincense essential oil. Turn the bottle of frankincense oil upside down and place it directly above the mouth of the bottle containing the carrier oil. 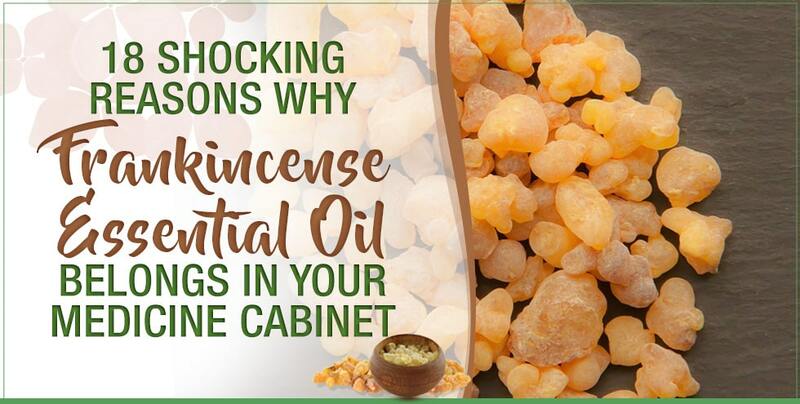 Shake the bottle of frankincense oil, allowing about 30 drops to fall into the carrier oil. Tightly put the lid back onto the plastic bottle. Shake the bottle vigorously for 30 seconds. After cleansing your face each day, pour out about one tablespoon of the oil into your palm. Rub your palms together and massage the oil into your skin using circular motions. Keep massaging the oil into the skin until it has been completely absorbed. Frankincense essential oil is known to cure headaches thanks to its monoterpene compounds that are found within the frankincense resin. These compounds have high anti-inflammatory properties that can eliminate headaches effectively and quickly. Frankincense essential oil works to relieve headaches by opening up blood vessels that are constricted and by reducing tension within the muscle tissue (source). To use frankincense essential oil to treat a headache, simply place a drop of the oil on each temple and under the roof of the mouth. Turn the bottle upside down and place the spout against your index finger. With the index finger of your other hand, gently tap the top of the bottle to release a drop of oil onto your finger. With the finger that is covered in frankincense oil, dab the space under the roof of your mouth. Repeat the process of extracting a drop of oil onto your finger twice for each temple. Each time you apply a drop of oil to one temple, massage it in a circular motion until it has been fully absorbed into the skin. Because of the anti-inflammatory properties found in the frankincense resin, this essential oil can work just as well as an over-the-counter anti-inflammatory medication for the relief of muscle and joint pain. Simply apply the oil topically to the affected area. The blood vessels will open up and tension in the muscle and joint tissue will decrease. A recent study proved that frankincense can reduce inflammation effectively (source). Take off the cap of a clean 10oz plastic bottle. Fill the bottle with a thin, easily spreadable carrier oil like sweet almond oil or jojoba oil. Take the cap off of your bottle of frankincense essential oil. Turn the bottle of frankincense oil upside down and position it directly on top of the mouth of the bottle that contains the carrier oil. Shake the frankincense oil bottle so that about 40 drops are released into the carrier oil bottle. Tightly place the lid back onto the plastic bottle. Vigorously shake the bottle for about 45 seconds. To treat muscle and joint pain, pour about two tablespoons of the oil into one palm. Then, rub both palms together so that they are evenly coated with the oil. Massage the oil into the affected area in a circular motion. Continue massaging the oil until the skin has fully absorbed it. According to a recent study, frankincense essential oil contains a chemical that is similar to steroids and is capable of boosting the immune system’s ability to function while fighting inflammation that can cause the immune system to attack the body (source). Frankincense oil also has antiseptic properties which means that it inhibits the growth of disease-causing microorganisms. These microorganisms can deplete the immune system over time, making one more susceptible to diseases. Additionally, the symptoms of several inflammatory disorders that decrease the immune system’s ability to function properly can be relieved with frankincense essential oil. Some of these disorders include Chrohn’s disease, rheumatoid arthritis, bronchial asthma, osteoarthritis and ulcerative colitis (source). Each morning, fill a tall drinking glass with water. Remove the cap from a bottle of frankincense essential oil. Position the bottle of frankincense oil at an angle so that its spout is facing the mouth of the glass of water. Tap the side of the bottle with one finger, allowing three drops to fall into the water. Stir the water for 15 seconds with a spoon. Drink the entire glass of water. Frankincense essential oil can break up phlegm in the lungs and its anti-inflammatory properties can ease a swollen and irritated throat. Therefore, this essential oil makes a fantastic cough suppressant (source). Pour three tablespoons of a thin carrier oil such as olive oil or sweet almond oil into a small bowl. Remove the cap from a bottle of frankincense essential oil. Turn it upside down over the bowl. With one finger, tap the side of the bottle of frankincense oil to release about 8 drops into the bowl containing the carrier oil. Stir this mixture thoroughly with a small whisk so that the oils are blended. Dip your fingertips into the bowl and massage the oil combination into the skin on the chest using a circular motion. Keep massaging the oil into the skin until it is completely absorbed. Thanks to its sedative nature, frankincense essential oil can work as a treatment for anxiety. During an anxiety attack, the sufferer may experience raised blood pressure, rapid heart rate, fast breathing and racing thoughts. Frankincense essential oil can actually alleviate all of these symptoms thanks to its unique chemical compounds (source). To reap the most benefits from frankincense essential oil in order to cure anxiety, pour several drops directly into a hot bath. Alternatively, you can add a few drops to an oil diffuser so that the smell permeates your home, keeping you in a relaxed state all day long. Take the lid off of the top of your oil diffuser. Fill the tank of the oil diffuser with water. Do not exceed the maximum fill line. Twist off the cap of a bottle of frankincense essential oil. Angle the bottle so that its spout is facing the tank of water. Tap your finger against the side of the bottle of frankincense oil to release four to five drops of oil into the water. Place your oil diffuser close to a comfortable location where you can sit quietly. Plug the oil diffuser into a nearby outlet. Turn the oil diffuser on. Sit nearby and take slow, deep breaths through your nose. For quick relief during an anxiety attack, unscrew the cap of a bottle of frankincense essential oil. Place the spout of the bottle directly under one nostril. Take slow, deep breaths through your nose. Do this until you feel your nervous system slow down. Frankincense essential oil can also break up mucus and phlegm that is blocked in the sinuses, throat and lungs. Take the cap off of a bottle of frankincense essential oil. Tilt the bottle so that its spout is facing the mouth of the glass of water. Use your finger to lightly tap the side of the bottle, releasing three drops of oil into the water. Some studies suggest that frankincense essential oil is capable of killing cancer cells thanks to its AKBA compounds. This seems to be the case for only certain cancers such as uterine cancer, colon cancer, prostate cancer and ovarian cancer (source). 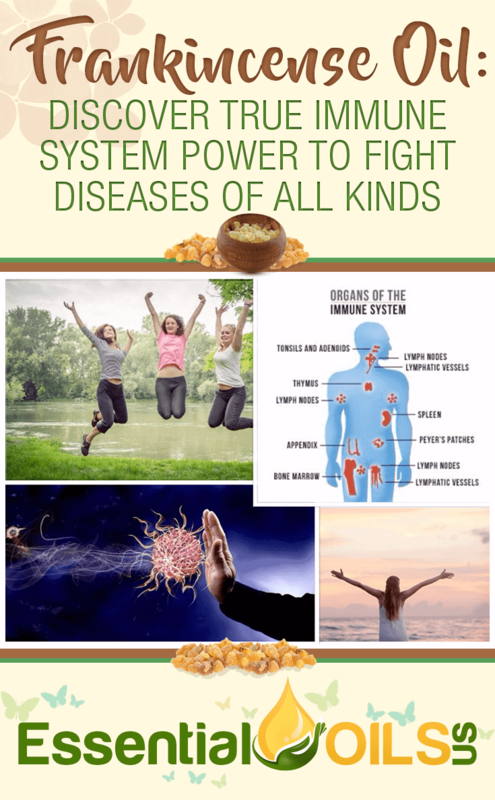 Many believe that frankincense essential oil’s ability to combat cancer cells has to do with its antiseptic properties that boost the immune system so that it can fight off diseases. Fill a large drinking glass with water. Position the frankincense oil bottle at an angle so that its spout is facing the mouth of the drinking glass of water. With your finger, gently tap the side of the bottle to release about three drops of oil into the water. Drink the entire glass of water. You can do this once each day. Because of its ability to slow down the nervous system and relax the mind, frankincense essential oil acts as an effective sleep aid. Frankincense can slow down breathing, calm down racing thoughts and lower blood pressure. By simply pouring a few drops of this oil onto your pillow at night, you can sleep more soundly and fall asleep sooner (source). Just before bedtime, unscrew the cap off of a bottle of frankincense essential oil. Turn the bottle upside down and position it directly over your pillow. Tap the top of the bottle with one finger to release three to five drops onto your pillow. 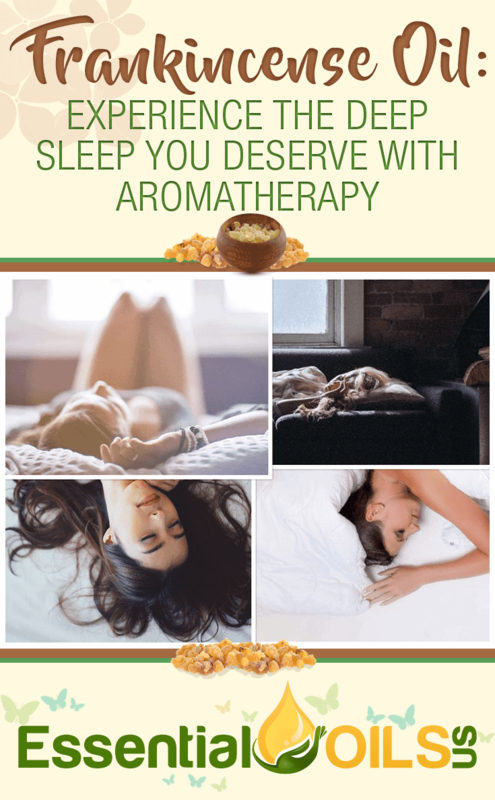 When you go to sleep, take deep breaths through your nose to inhale the aroma of the oil. Frankincense essential oil can relieve gastrointestinal pain and discomfort with its anti-inflammatory properties. 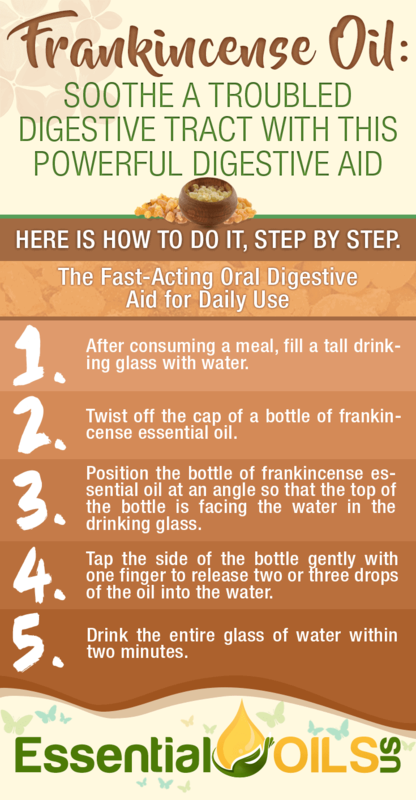 By ingesting a few drops of the oil, you will allow your digestive tract to relax. Once the digestive tract is relaxed, food and gas will pass through more easily (source). Studies also show that frankincense’s anti-inflammatory properties can relieve many of the symptoms that are associated with irritable bowel syndrome (IBS) as well as ulcerative colitis (source). After consuming a meal, fill a tall drinking glass with water. Twist off the cap of a bottle of frankincense essential oil. Position the bottle of frankincense essential oil at an angle so that the top of the bottle is facing the water in the drinking glass. Tap the side of the bottle gently with one finger to release two or three drops of the oil into the water. Drink the entire glass of water within two minutes. Frankincense has been used since ancient Egyptian times as an effective asthma treatment (source). Research shows that the chemical compounds in frankincense can effectively prevent the risk of having an asthma attack by keeping the airways open (source). Fill this bottle with a carrier oil that has a thin consistency such as jojoba oil or olive oil. To make pouring easier, you may choose to use a small funnel. Take off the cap of a bottle of frankincense essential oil. Turn the bottle of oil upside down and place its spout directly on top of the mouth of the plastic bottle. Shake the frankincense oil bottle up and down to release about 40 drops into the carrier oil. Tightly screw the cap back onto the plastic bottle. Shake the bottle for about 45 seconds. Each day, pour about one tablespoon of the oil into one palm. Rub both palms together. Massage the oil into the skin on your chest in a circular motion until the oil has been fully absorbed. Also, massage a small portion of this oil directly under the nose. Frankincense essential oil is an incredibly safe and natural diuretic that promotes urination and regulates the urinary system as a whole (source). Remove the lid from a bottle of frankincense essential oil. Position the bottle of frankincense oil at an angle so that its spout is above the water in the drinking glass. Lightly tap the bottle with your finger, allowing it to release about three drops into the water. With a spoon, stir the water for about 15 seconds. Drink the full glass of water. You may drink this once each day. Frankincense essential oil has the unique ability to fade scars and stretch marks because it acts as a cicatrisant, meaning that it encourages the skin to heal very quickly. By rubbing frankincense essential oil on the affected area, the skin will regenerate at a faster rate and marks and scars will disappear sooner. Remove the lid from an empty 10oz plastic bottle. Fill the plastic bottle with a carrier oil that has a spreadable and thin consistency like jojoba oil or sesame oil. Twist off the cap of your bottle of frankincense essential oil. Position the bottle of frankincense essential oil upside down and place its spout directly above the mouth of the plastic bottle containing the carrier oil. Shake the frankincense oil bottle vigorously so that about 50 drops of the oil fall into the carrier oil. Tightly place the lid back onto the plastic bottle. Shake the bottle for about one minute. Once a day, pour about one tablespoon of the oil into your palm. Rub both of your palms together. Using circular motions, massage the oil into the affected area. Keep massaging the oil until the skin has completely absorbed it. 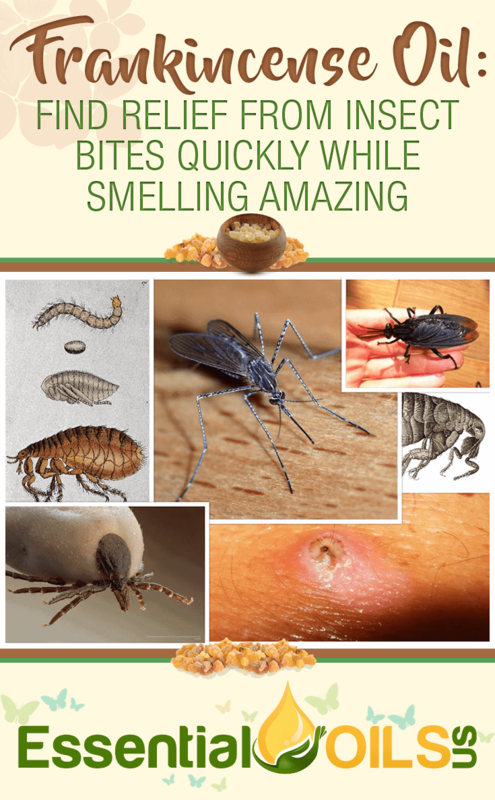 Because of its anti-inflammatory properties, frankincense essential oil can reduce pain, itching and swelling associated with insect bites quickly. You can simply apply a drop of the oil to affected area (source). Turn the bottle upside down and place it directly over the insect bite. Tap the side of the bottle with your finger to release one or two drops of the oil directly onto the insect bite. Place the frankincense oil bottle down and use your fingers to massage the oil into the affected area using a circular motion. Frankincense essential boasts a unique combination of antiviral, antimicrobial and antiseptic properties, making it a powerful disinfectant. By combining white vinegar with the oil, you can clean your house thoroughly and rid it of dangerous germs. Twist the cap off of a 20oz spray bottle that is completely clean and empty. Using a funnel, pour four cups of white vinegar into the spray bottle. Position the frankincense oil bottle above the spout of the spray bottle and turn it upside down. Shake the bottle of frankincense oil so that about 50 drops fall into the spray bottle. Tightly place the cap back onto the spray bottle and shake the bottle for one minute. Use this cleaning spray as you would any household cleaner. Frankincense’s name comes from the French phrase “franc encens” which translates to “high quality incense.” Frankincense is a resin that is tapped from one of four species of the Boswellia sacra trees. It is widely believed that the best quality of Frankincense resin comes from Somalia. For over 5000 years, Frankincense has been traded and widely in demand because of its highly pleasant scent as well as its medicinal properties (source). Frankincense can be found in many perfumes because of its scent which is described as a combination of citrus and pine. Additionally, frankincense essential oil boasts a large number of health benefits. The oil is also used as a disinfectant and is found in many natural beauty products. Frankincense essential oil contains mostly resin acids. It is also made up of boswellic acids in which most of its healing properties are contained. The oil also contains a-pinene, actanol, linalool, bornyl acetate and octyl acetate (source). Frankincense essential oil is extracted using the steam distillation method. Steam is pushed through the frankincense resin and collected before being converted into essential oil. Typically, it has a yield rate of about 3 to 10 percent (source). 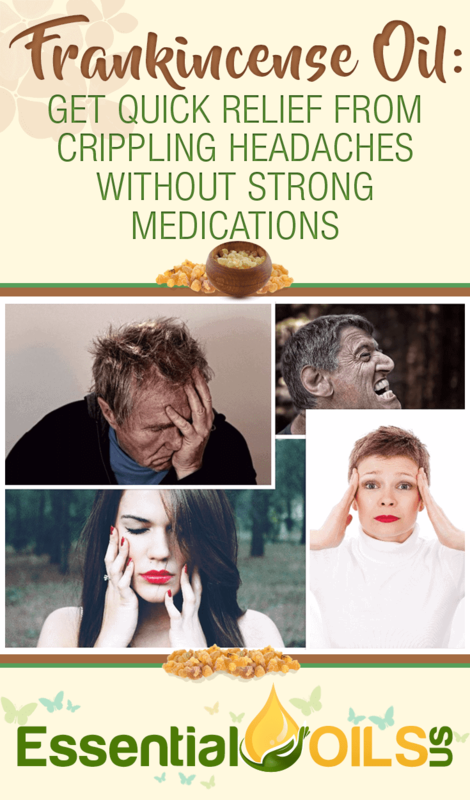 Numerous studies have proven that frankincense essential oil is highly effective when it comes to treating numerous physical and mental ailments including clinical anxiety, anti-inflammatory diseases and autoimmune disorders. Frankincense oil can be safely taken in multiple ways. It is applied topically when used to treat skin conditions such as bug bites and skin conditions. Also, it is applied to the skin to treat muscle and joint pains, congestion and headaches. When taken topically, frankincense essential oil can be applied directly to the skin or combined with a carrier oil like olive oil or coconut oil. Frankincense oil may be ingested in order to treat certain cancers, inflammatory illnesses and digestive disorders. Additionally, many people inhale frankincense essential oil because of its calming abilities, its decongestant abilities and its ability to reduce blood pressure and heart rate. Many people like to add several drops of frankincense essential oil to a hot bath. The steam aids the inhalation process. 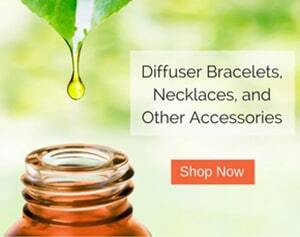 Many people also use oil diffusers in order to inhale essential oils throughout the day. An oil diffuser is a small tabletop device that can be placed in any room. It combines essential oils with hot water and is heated to release a stream of scented steam throughout your home. Frankincense essential oil may be used topically on children who have bug bites, scars or muscle and joint pain. Children may also ingest frankincense essential oil as a treatment for colds, the flu and various digestive issues. Adults can take frankincense oil to treat a variety of ailments. 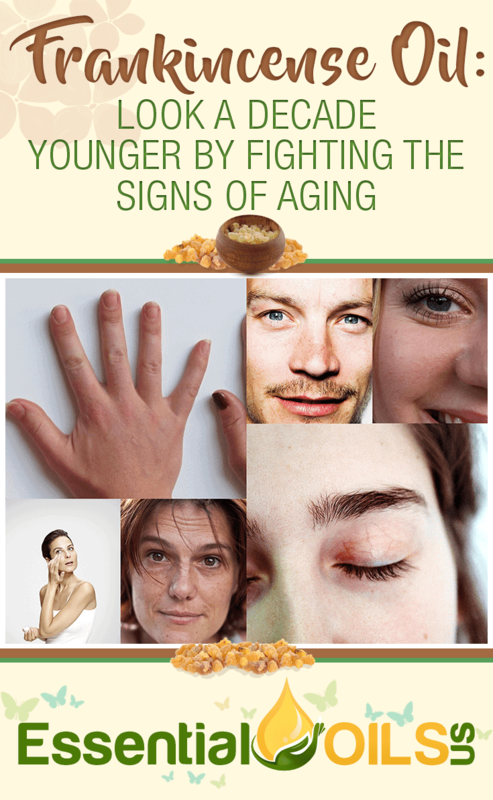 They can apply it topically to the skin, ingest it or inhale it through various methods. Is Frankincense Essential Oil Safe? Frankincense is considered to be an incredibly safe essential oil that can be taken both topically and orally. It has been used safely for centuries because of its numerous medicinal benefits. There are no known side effects of frankincense essential oil. In extremely rare cases, skin irritation may occur when applied topically for a long period of time (source). There are no known dangers of combining frankincense essential oil with other medications. Frankincense essential oil is likely safe for women who are pregnant. However, there has been little research about its effects on pregnant women. Therefore, some doctors may suggest avoiding it. Frankincense essential oil is safe for children to take orally, topically and through inhalation. Where can I buy Frankincense Essential Oil? Frankincense essential oil is widely available. It can be found in many grocery stores, specialty shops and online retailers. Frankincense essential oil has been used since ancient times to treat many physical and mental ailments. Because of its unique healing abilities, it is still widely used today as a form of alternative medicine. Plus, because of its woodsy and citrusy aroma, frankincense essential oil is frequently worn as a perfume. If you enjoyed this list of frankincense essential oil health benefits, feel free to share it with your friends. Let us know in the comments how you like to use frankincense essential oil.